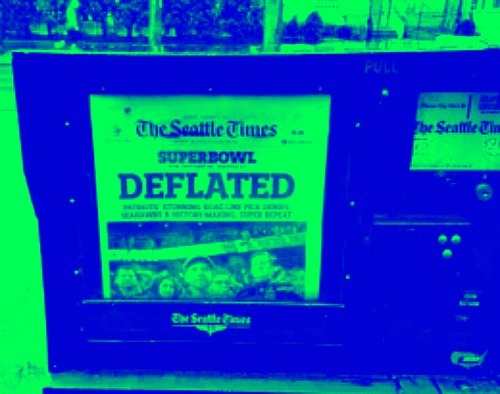 Z and I were downtown this morning, and the city is subdued after yesterday’s Super Bowl loss. For two weeks, the mood here has been like two clicks better than Christmas—the buildings were lit up with blue and green, the “12” flags were flapping like mad…even on windless days, and almost everyone was friendly and feeling like an “us” which doesn’t happen often. The rest of the country arguably finds the Seahawks insufferable, though the perspective here in the upper northwestern corner of the country is that they’re mostly just quirky and misunderstood. But today? The mood was the exact opposite. It’s been a sunny, warm winter, but today it was gray and rainy, and everyone downtown looked downtrodden and as if they each had their own personal rain cloud right above their heads while depressing Charlie Brown music played. If it hadn’t been so glum, it would have been hilarious. I don’t like football. The Sundays my father had me were spent largely in front of a televised game—the Bengals being his team, but really, any team, so long as a game was on. (The only thing worse than football season from my perspective was not-football-season when golf was on TV. I’m convinced that the background noise in Hell is that of 24-7 golf commentary.) I didn’t like football’s loudness. I didn’t like what looked to me like meanness. And frankly, I couldn’t for the life of me understand why watching a bunch of grown men play a game on TV was more fun than playing Klomp-It or Sorry! with me during our visits with each other. Football became briefly tolerable while I was in high school and was dating a fullback, whose rudely numbered jersey I got to wear. I went to every game and worried that he’d be hurt and couldn’t wait for the season to be over so his practices would no longer interfere with my own plans for him. Like a good football player’s girlfriend, I played “Powder Puff” the one week—homecoming—when girls were mysteriously declared eligible to play, though the truth is I didn’t know a second down from a second inning and the more athletic girls were mostly annoyed with me and both my ignorance and lack of skill. I did love that jersey though. As an adult, I’ve hated football for a variety of reasons in addition to the sound of it in my living room. As a reader and lover of the arts, I hate the way sports takes precedent over things I care about; I hate that the players and coaches and the industry can generate huge amounts of money for pummeling each other into concussions for fun while people teaching tiny kids or college kids, and people providing real services like secretaries and garbage collectors, are sometimes working for peanuts; I hate the above-the-law lifestyle some of the players live; I hate the games’ violence and the violence off the field, sometimes directed at loved ones; I hate the way normally decent people can turn into real jerks based on team allegiance. It’s an ugly, ugly sport. 2) I moved to Seattle. Because I met Z a few years after his rugby days were over, I don’t think of him as particularly sporty, but he is. It’s taken some years with him illustrating how sports can enhance a life for me to understand that my anti-organized sports stance was no different than those people who thought I was a loser for constantly having my nose in a book. I have come to see that while I’m sure those athletic girls in high school thought of me as a “waste of space” standing there, mouth agape, while the football was in play, I was just as bad for pigeonholing them because I thought of them as dumb jocks. Maybe they were; maybe they weren’t, but my assumption was if they had athletic prowess, they probably weren’t so bright. Z, the Renaissance Man, has shown me the error of my ways. And then there is Seattle. A city that is not really all that sporty. We have some teams, sure, but mostly the people here are all about reading some books and screwing around with their computers and drinking some coffee. Maybe hiking somewhere on a sunny weekend. Which somehow makes their love of the Seahawks more tolerable to me because I know it is not the sum-total of their thoughts. Because of these two elements in my life and the Seahawks’ return to the Super Bowl, I got a little football crazy. I started seeing the beauty in a particular players moves and the remarkable skill involved in hurling a ball somewhere it needs to be or catching a ball that wasn’t meant to be caught. In the last three weeks or so, I’ve read more sports columns and watched more football clips than I have in my entire life. (The only reason I don’t have stats memorized is because I’m notoriously bad with numbers.) I started following Richard Sherman and his girlfriend on Twitter. I read every thing I could on Marshawn Lynch to better understand his reluctance to speak to the press and began to feel like I was channeling Chris Crocker, the “Leave Britney alone!” guy because I felt so defensive of Lynch. I tried to figure out ways to work “I’m just about that action Boss” into daily conversation. I worried about the injuries sustained by Seahawks in the playoffs. And I wondered what kind of gum coach Pete Carroll chews so vigorously. Two weeks ago for the division championship, Z and I had friends over, whose 14 month old—the tiny Pippi Longstocking—we terrified with our screaming and hopping. They returned for the Super Bowl and it should have been fun watching the game with them and doing our best to convince Pippi that our cheers were all about whatever adorable thing she’d just done instead of a good play or a call in our favor, but for the most part, it was in agony—at least for me. I was a nervous wreck. I felt feverish and twitchy. What if we lost? It’s been such a fun year in a city with Super Bowl champs—I didn’t want to turn into Super Bowl losers. It turns out, I’d invested so much time in learning to love the Seahawks and hate the Patriots, that I’d actually begun to think the game’s outcome was important to my life. I was elated when we were ahead, depressed when we were down, and absolutely gobsmacked at the end when a game that could have been the Seahawks’ suddenly wasn’t because of the most head-scratchingly bad play imaginable. The air was sucked right out of the room when Russell Wilson’s pass was intercepted and we all knew the game was over. Pippi started to cry, and though it was her bedtime, I can’t help but feel she was just expressing what all of us were feeling. Then punches started flying on the field and it all just felt so sad and, well, stupid. The day before the Super Bowl, Z and I were tooling around in a rental car, musing about the NFL and the brain injury issues and some of the other disturbing elements tied to football, and he said, “You know, we talk about the Romans at the Colosseum like it was barbaric, but we really aren’t as far removed from it as we think we are.” Instantly, I got sucked back ten years, standing in the Colosseum with my cousin G, praying the tour would end soon because the place gave me the heebie-jeebies and I wanted to escape it. Some might argue it was all in my mind (though this was before I saw Gladiator or HBO’s “Rome” so there wasn’t really much in my mind other than a childhood image of a Christian being treated like a human cat toy), but I think there are vibes there—not just of terrified people being torn apart by gladiators or wild animals but of frenzied crowds cheering to see the spectacle, wanting to align themselves with the victors instead of the losers. It’s a dark, dark place, the Colosseum. When the game was over yesterday, I told Z that was it. I’m done. Football is over for me. I can’t do this to myself next year, this getting my life all tangled up with the performance of a bunch of men I don’t know, many of whom are only as loyal to the team as their next contract negotiation. Watching a sporting event should not require benzodiazepines. It’s a game. And even if the Seahawks had won yesterday? I’m not getting a Super Bowl ring for all my attention and cheering. So, I’m hanging up my “12” hat and going back to the books and the “30 Rock” binge watching on Netflix. Except today, when I read that Vegas is already saying Seattle is the favorite to win Super Bowl 50 next year? My heart did the tiniest of flutters. This is just wonderful. You are becoming a Seattleite: drink coffee, read books, hug a tree and fall in love with the Seahawks! It all makes sense….if you live in Seattle. In this blog post you have very well expressed the mystery of love, we can’t help ourselves and we will be 12s again soon enough! Thanks, Valarie. I saw a tiny dog today in a Seahawks cheerleading outfit here on First Hill and it made me smile. I remain somewhat mystified by and wholly uninterested in football — but I don’t live in Seattle. And it didn’t stop me from loving the first season of “Friday Night Lights”.